Life as we know it requires water, and is based on the chemistry of organic molecules. To be “organic” (as opposed to “inorganic”), a molecule must contain carbon. For example, vinegar (CH3CH2OH) is organic, whereas water (H2O), though something organisms depend on, is not. Cells and their organelles are made out of organic molecules commonly called biochemicals. To form chemical compounds, atoms bond together, producing stable structures. To achieve this, the electron configurations around the various nuclei in the compound must also be stable. This stability is achieved by sharing electrons between the atoms. A covalent bond forms when the atoms share the electrons reasonably equally. The alternative is called an ionic bond, where one atom actually loses the use of one or more electrons to another atom. In between these two extremes, bonds are termed polar covalent. Molecules with polar covalent bonds have dipoles, regions with slight positive and negative natures (abbreviated δ+ and δ- respectively). With this as a starting point, the Chemistry of Life study guide unit takes a close look at water and its properties before examining the relationship between hydrolysis and dehydration synthesis reactions. This information is put immediately into context, as the four major classes of biochemicals, carbohydrates, lipids, proteins and nucleic acids are considered in terms of their structures and functions, with a particular emphasis on human systems. This study unit concludes with a look at ATP and how it is used as an energy storage molecule in cells. 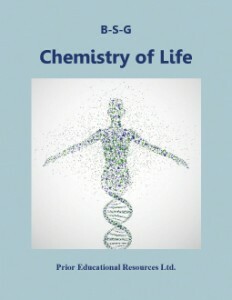 Chemistry of Life is excerpted from our Biology 12 Study Guide, which is the sixth edition of a student study guide written to match the curriculum of British Columbia. The concepts presented are applicable to the biology curricula of other educational jurisdictions as well.